Technical marine illustration. Noted particularly for his intricate technical art, he has worked closely with some of the world's leading naval architects and designers to bring their concepts to life. His working knowledge of boats stems from four years of employment as a yacht designer and model-maker for Robert E. Derektor. Web Site Snapshot: If available, above is a snapshot of the Bruce Alderson web site at http://www.brucealderson.com/ as it appeared when this site was added to the directory or last verified. 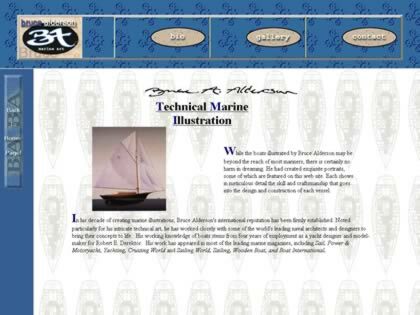 Please Note that Boat Design Net has no involvement with the above web site; all content and images depicted in the above thumbnail are the property and copyright of Bruce Alderson unless otherwise noted on that site. Description: Technical marine illustration. Noted particularly for his intricate technical art, he has worked closely with some of the world's leading naval architects and designers to bring their concepts to life. His working knowledge of boats stems from four years of employment as a yacht designer and model-maker for Robert E. Derektor.